There’s a debate surrounding the official start of summer. Does it kick off on Memorial Day Weekend, the Solstice or after the splash of that first glorious cannonball? Whenever you choose to celebrate the season, there’s just something special about the feeling of summer. Longer days lead to more possibilities, and lightness seems to find its way into everything. From last minute barbecues to pool parties, the list of summertime activities fills up quick. Before long, this constant barrage of fun can make your schedule slip and slide away from you. Burning the (roman) candle at both ends can lead to strain professionally and personally. To avoid this “Summer Shock,” do your best to plan ahead! Plot out any time off you may be taking, prioritize your opportunities and make sure family, friends and coworkers are all on the same page. Everyone needs a little spontaneity during the season; but a little bit of planning goes a long way towards setting yourself up to be able to find and embrace those moments! When the vacation itch hits, it hits hard. In the excitement of the moment, it can be easy to let your plans get out of hand. Soon, a weekend away at the beach turns into a fifteen-stop journey! Organizing such an endeavor (especially with the whole family) can end up causing more stress than its worth. Keep in mind that vacation time should be a relaxing occasion to recharge; you don’t need to conquer the world in one trip! If this sort of undertaking sounds daunting, plan shorter trips that are more manageable and build in chunks of open time to ensure you’ll find moments of peace. Remember, a vacation is whatever you make of it, whether it’s a one-day hike or a month-long journey. Let Tech Work For You…Then Turn it Off! Smartphones, tablets and virtual office tools allow for increased flexibility for work teams. Try and find ways to set yourself up for success by using technology to your advantage. For example, applying a thorough vacation automatic reply to your e-mail account ensures that your personal time is being communicated clearly to coworkers. You can even work in a few video conferences at the start and end of your vacation time to stretch out your time away from the office. 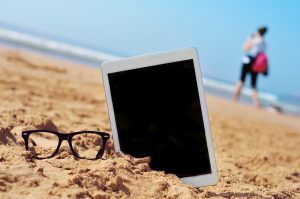 However, it’s important to note that while technology can help us stretch our legs during the summer, it also helps the office to follow along for the trip. There’s nothing worse than being buried in your phone while memories are happening right in front of you. To avoid this, establish times to disconnect entirely; turn off your devices completely if you need to! These tools should be used help you find better stability between home and office, not drag you deeper into the stress of your work. We may all have a different idea of when the season really starts, but the feeling of summertime is undeniable. Find your own way to recharge for the colder months ahead by planning trips that work for you! Do you have any suggestions for striking that perfect summer balance? Post them below! This entry was posted in Currently Employed and tagged preparing for vacation, summer at work, summertime, vacation time, Work-Life Balance. Bookmark the permalink.